Toy Animal Heads – Fauxidermy Discovered. Kids Wall Lights – My Top 10! Rainbow wall Art and Decor! I am in awe of some of the comic strip wall art stickers I’ve found. 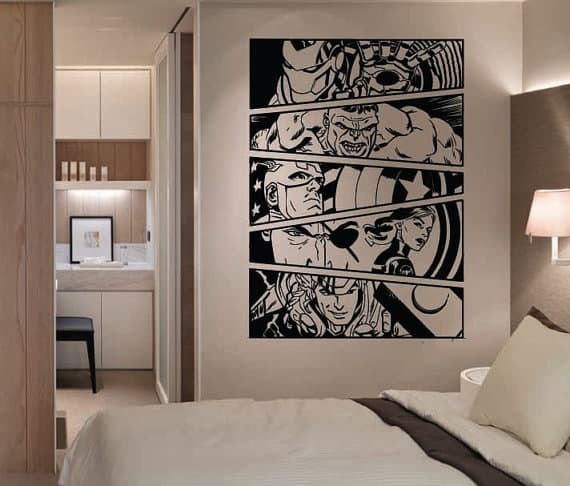 These wall stickers can look incredibly impressive and striking and for a comic book fan, your child will be delighted with how a simple wall sticker can transform their room. 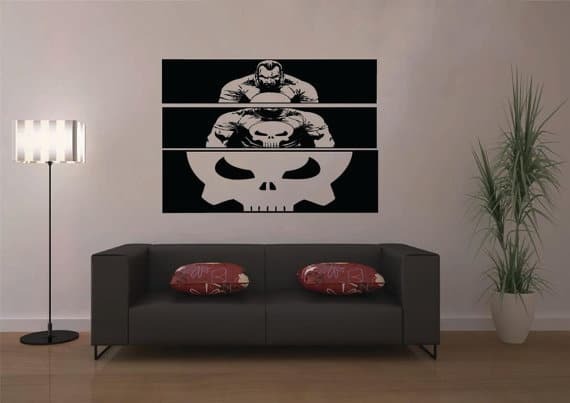 The Punisher Comic strip wall art sticker – a large sticker that comes in three strips. Super stylish, this would look amazing on an older child’s wall – it is removable but not reusable. It comes in two sizes A1 – 60cm(h) x 84cm(w) and A0 – 84cm(h) x 118cm(w). Check details and prices. 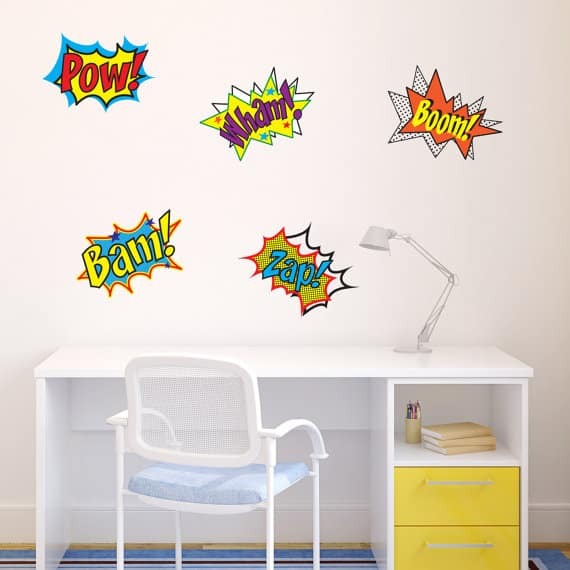 Simple but fun, these comic pop word wall stickers! They come in a set of 5 comic themed related words. Easy to apply and remove. A great addition to your child’s comic themed bedroom, they’d also look great in conjunction with some other comic themed stickers – such as with batman or spiderman wall stickers. Check details and prices. 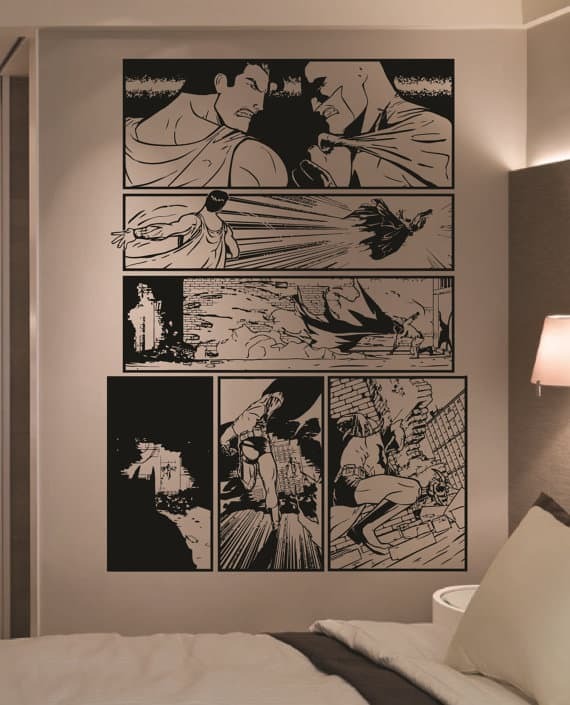 Funky comic strip wall sticker, depicting a battle between Superman and Batman! Full instructions included, as well as options for different sizes and colours are available. Welcome To Wall Art Kids! To keep in touch and get hold of our most recent posts, simply add your email address below! 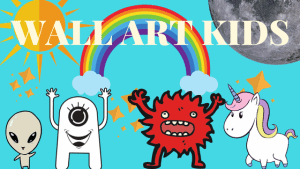 Wallartkids.com is a participant in the Amazon Services LLC Associates Program, an affiliate advertising program designed to provide a means for sites to earn advertising fees by advertising and linking to Amazon.com. This is at no extra cost to you.